This commentary is NOT about politics, although many of you will think it is. If you are anything like me you are suffering from campaign overload. It is as if the only news in the world is Trump/Cruz, or Hillary/Bernie. Twenty-four / seven the cable news programs force-feed us propaganda regarding the fake horse-race known as the Presidential primaries. If you think that the political system is honest and that the will of the people has any place in the decision making process this article is not for you. The system is rigged folks. The evidence is everywhere you look. The Presidential primaries are the biggest con going and it is Big Bu$$ine$$ for those who report on it. The once-independent media is controlled. We no longer get the “news” but instead are fed a flavored version of events designed to control the masses. Yep, even your favorite talk-radio host is in on the gig. Talk-radio is major-moolah and you can bet your last dollar that every one of these guys is in the tank for somebody. Some are out in the open…Beck, Levin…others give the appearance of neutrality…Rush, Hannity, but make no mistake all of the major talkers know exactly where their bread is buttered. How do you think that they got to where they are? Why is there so little agreement in the “conservative” press? Controlled media. That is what someone once labeled them. But it is not so much that they are controlled but that their real job is to control you and me. If we, the great unwashed, were ever given the opportunity to know the truth this nation would be in all out revolt. We live in a captured nation and the “conservative” media is playing the role of prison guard. Their job is to keep the prisoners fat and sassy. At the end of the day, they are responsible for making sure that you feel secure because Rush or Sean or Mark or Glenn is on the job. I travel a lot. I don’t say that to sound important but rather, to make a point. Sometimes I fly, but often I drive. Long lonely trips across the fruited plain give me the opportunity to ride in silence as I listen to my ever-present companions…Glenn, Rush, Sean, and Mark. That is the order that they come on. I don’t care what state you are in or what time-zone you are traversing, America’s airwaves are blasting out the conservative opinions of these “conservative” voices. Beck in the morning, Rush at noon, Hannity in the afternoon, and Levin to sing you to sleep at night. Every city, every state, every day. Republican good-Democrat bad, conservative good-liberal/progressive-bad, Cruz good-Hillary bad. Remember, they are looking out for us!! Yeah right. They’re looking out for us, alright. They are doing an awesome job of keeping the sheep herded and in the Republican pen. 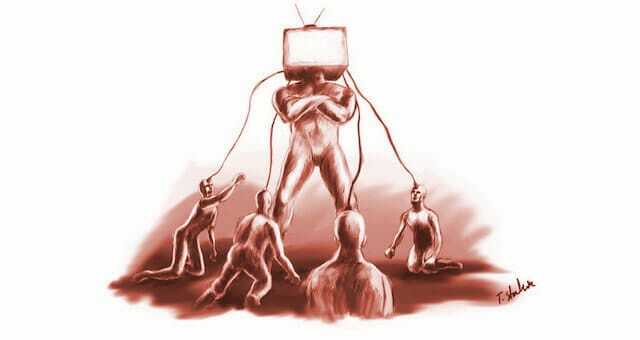 Big media controls the news by controlling the voices. Who arranged this cozy set-up? Why is it that, for the most part, local talk radio, except for morning and evening drive-time, is almost non-existent on America’s airwaves? Why do all of the “Big talk” stations in every community have nearly the exact same lineup? They decide, you report. We are sheep heading for a great shearing. Rush started the re-birth of AM radio with his talk show in the mid 1980’s and to some degree he changed the way American’s viewed the news. But after nearly three decades of conservative talk-radio can you tell me ANYTHING the talkers have actually accomplished? Has the size of government shrunk? Have individual liberties increased? Has “conservative radio” changed the moral landscape in any way? Have the BIG $ Talkers slowed down the spread of the godless agenda in any way, shape or form? Is America more or less evil than it was 30 years ago? What good has the controlled (and controlling) conservative talk media done for the advancement of Christian values? Nothing. The programs weren’t designed to advance Christian values. They were designed to advance “conservatism. “ As I tried to warn folks back in 2006, Conservatism is Counterfeit Salt. It looks like salt, it sounds like salt, but it is a poor substitute for Christianity. America’s problems are spiritual and there is no political solution to a spiritual problem. Conservative talk radio does not offer a Biblical, Christian solution. So today I would like to offer you an option. Turn off your favorite talk-radio station and connect online. The internet is FULL of “talk-radio” programs that boldly reveal the truth behind the news and are guaranteed to open your eyes to a world that the “men behind the curtain” do not want you to see. Find programs that present the Truth and offer Biblical solutions to the problems facing us. Not preachy-pastor sermons…but hard-hitting issue based shows with Biblical solutions. Christian radio has, for the most part, dropped the ball. Their daily program schedule is filled with preaching, financial shows, and health-related programs. Just like the local churches, most Christian media is full of happy talk while the world around us descends into chaos. May I suggest a few? I know I will leave out some good ones, bit at least this is a start. Visit The Hagmann and Hagmann Report, The Common Sense Show, Caravan to Midnight, Info-Wars, The Manning Report, The Weekend Vigilante, Sons of Liberty. Without seeming to be self-promotional, I too, have a daily live internet program that is archived for downloading later. We air weekdays at 7 am EDT www.coachdavelive.com. Get out of the box the media has locked you in. My people are destroyed for a lack of knowledge!! When all hell breaks loose people will be looking for a heavenly solution. Now is the time to build an ark.